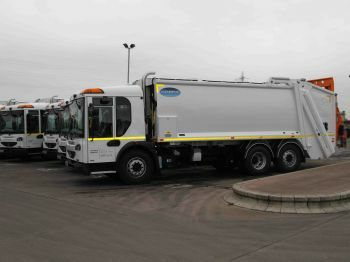 When the Lichfield and Tamworth Joint Waste Service recently replaced some of its waste collection fleet, it took the opportunity to install the latest vehicle safety equipment on the new vehicles. After investigating suppliers in the market place the authority chose Coventry-based vehicle safety experts, Innovative Safety Systems Ltd (ISS), to equip the new vehicles. A one-stop shop for the design, supply, installation and maintenance of vehicle safety and visibility technology, ISS is well known for providing market-leading products, in particular hard-disk recording equipment. Lichfield District Council provides the fleet management for the Shared Waste Service and first took the decision to fit vehicle recording equipment to its waste collection vehicles over three years ago, to help with accident investigations and to defend or reinforce insurance claims across Lichfield District and Tamworth Borough. This year the authority had the opportunity to replace six of its fleet vehicles and at the same time fit the latest safety technology. The Dennis Eagle RCV’s have all been fitted with ISS RV4 Hard Disk Recording equipment, with four cameras situated around the vehicle providing 360-degree coverage. ISS has also installed highly effective reversing radars that detect static as well as moving objects unlike most other radars, which require a closing distance. For the first time in its history, Sefton Metropolitan Borough Council in Liverpool has recently decided to install hard disk recording equipment, and ISS is fitting the technology to 25 new refuse vehicles. ISS designs, manufactures, installs and maintains the full range of safety and lighting products including reversing radars, CCTV camera systems, warning beacons and LED lighting packages.